Dormant Oil Sprays: The first pest control applications in tree fruit usually consist of oil and copper sprays. These are long standing standard recommendations that are not without special considerations. Oil is generally recommended at rates of 2%, or 2 gals. per 100 gallons of water for dormant applications. Traditionally this has translated to 4 gallons of oil per acre for stone fruit based on a dilute volume of 200 gallons per acre: the amount generally considered to cover a mature peach tree to the point of drip. For pome fruit the recommendation has been 6 gallons of oil per acre based on a dilute volume of 300 gallons per acre: the amount generally considered to cover a mature semi dwarf apple to the point of drip. To adjust the dilute volume required for immature orchards and trees on dwarfing rootstocks consult pages 25-30 of the 2016 New Jersey Tree Fruit Production Guide. Oil acts by suffocating overwintering scale insects and mite eggs as they begin to respire in the spring. Since fruit tree architecture includes many cracks and crevices as well limbs and twigs that exponentially increase surface area, coverage to the point of drip is key. Coverage is never perfect and since a single female san jose scale can produce up to 400 crawlers per generation, it’s important to try to get as close to 100 % coverage of the scaffold and trunk surface area as possible. It’s worth mentioning that opening up canopies with proper pruning can go along way toward accomplishing that goal. Oil can be safely applied up to the pink stages of peach and apple. Delayed dormant applications applied for mite suppression should effectively control scale and suppress early season aphids Multiple applications are often recommended in apple and may be beneficial where both scale and mites are a concern in peaches. Since conditions are seldom optimal for good coverage in the spring, multiple applications also help to get close to the goal of 100% coverage. Where multiple applications are made the rate is generally dropped the closer an application is made to bloom. So a split application in apples for example might consist of a 2% application up to ½” green, and a 1% application up to tight cluster. An application @ ½ % at pink is an option that may provide additional insurance. Growers that have been having difficulty controlling scab may be considering control programs that shift to materials like captan in pre-bloom or bloom sprays. This type of program would not be compatible with split oil applications since captan applied less than 10-14 days after an oil application will injure fruit trees. The same precaution should be given for any oil based product such as Fontellis. One sees many recommendations for mixing OP’s such as Lorsban or Supracide with dormant oil applications to improve scale control. The general consensus seems to be that the addition of these materials is of little benefit. These materials also increase the risk of oil phytoxicity from cold temperatures. These organophosphates also control rosy apple aphid, however in recent years we’ve observed poor control due either to resistance or more likely, poor timing. Combinations of oil with the IGR’s Esteem or Centaur should improve scale control in heavily infested orchards. Esteem at this timing will also control rosy apple aphids. It may be worth considering Chlorpyrifos (Lorsban, and other products) if the orchard has had trouble with Ambrosia Beetle. Several sites in New Jersey have reported damage from this newly described pest of tree fruit. We currently do not have a control recommendation for this pest, however chlorpyrifos and pyrethroids have been described as effective in the literature. Timing would be as early in the season as possible, before 1/2 green, which fits very well with rosy aphid timing. Be aware however that pyrethroid applications this early in the season may lead to mite flare ups later on. Oil is also useful to deter early season egg-laying by pear psylla since adults are repelled by oily surfaces. The objective is to delay egg deposition for as long as possible so that most of the hatch occurs after bloom. We can then target the nymphs during a compressed hatch period. Egg-laying usually commences by early March and gets into full swing by late in the month. 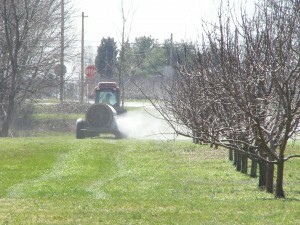 So it is good to get the first application of oil on pear trees as soon as the weather permits in March. Oil should not be applied when temperatures are expected to drop below freezing within 48 hours of application. Surround, a kaolin clay product, also works to supress psylla egg laying and can be applied at 25-50# per acre starting at dormant or delayed dormant and continuing on a 7-10 day schedule through bloom. Dormant season copper Sprays: Coppers are early season fungicides recommended for early season scab control and fire blight suppression in apples and pears. Coppers are also used for peach leaf curl control, and should be applied before or at bud swell. Many different copper formulations are available and it’s often difficult to decide which one is best, and is also labeled for the crop and season of application.